5 What about the torch? 6 What about star trails? The most important factor is to find an area where light pollution is low. Light pollution means that the sky is brightened up by surrounding light sources. In areas with strong light pollution you can see much less stars than in an area without light pollution. The result will be a photo with a more or less a white and washed out sky. Actually it is not that easy to find good areas in Europe as density of population is quite high. People who watch the starry sky in a city will be really(!) impressed when looking into a night sky in an area without light pollution. 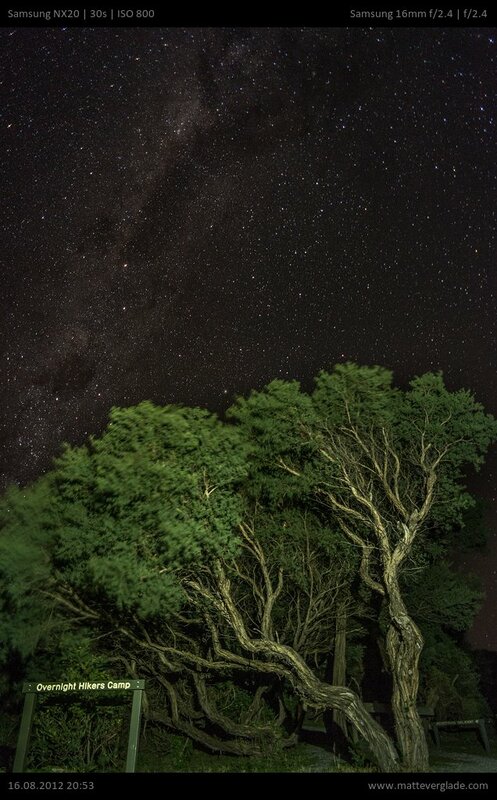 During my journey to Australia I was in the outback far away from any urban light sources and was stunned by the beauty of the night sky. There are several websites on the web that serve maps showing the light pollution, even Google Earth has an overlay to show the light pollution. Find a good resource for your location and try to find a suitable location for your shooting. Another problem is the moon. The best days to shoot the stars are the days around “new moon“. In other words: No or low light emission of the moon potentially enables you to take better pictures with more stars on it. The problem is that the moon brightens up the sky way too much and you have a similar problem as with light pollution. The last thing you simply need to be aware of is the rotation of the earth. You can’t expose the images too long (except you want to do star trails) since you would get problems with the stars being shown as short strips. This influences the exposure settings you have to choose later. So what do you need to take with you to shoot a night sky? You need a camera with good high ISO capabilities. It either needs an integrated timer or a connection for a remote control. A swivel screen can be really handy, but is not mandatory. The lens is best suited with a low maximum aperture and a low focal length (10-20mm). If you have a remote shutter trigger for your camera you should use it. Alternatively you can use the self timer of your camera. As you have to use slow shutter speeds a tripod is mandatory to avoid blurred photos. Make sure your tripod can hold the camera with the lens facing to the sky. There are devices that can be used to compensate the rotation of the earth. Those devices are called “equatorial” mount and they cost quite a lot (e.g. Vixen Polarie, about 400€). Therefore this is optional and I will show you the way how to do it without such a device. After you arrived at your selected location you have to prepare your gear. Mount the camera with the wide angle lens on the tripod and, in case you own one, attach the remote control. Now you need choose the proper settings. Some settings are described in depth in the Samsung NX Camera Settings Guide. You might also (re)read the Introduction to the basic concepts of photography. This might help you to understand the correlation between ISO, shutter speed and aperture which is useful to understand how you have to adjust the other respective values in case you are changing one specific setting. Switch to manual mode (M). This is the most flexible setting, but it is bounded above. You should try to avoid a shutter speed longer than 45 seconds or you will slowly start see the motion of the stars. Try to start with a shutter speed of 30 seconds and adjust it later. You need to increase the shutter speed when using a slower lens or a lower ISO number and vice versa. Shutter speeds longer than 30 seconds can be used in bulb mode, but this only makes sense using a remote control as the shutter needs to be pressed during the exposure. The more light you can capture the better. Set the aperture to the maximum aperture or stop down a bit to avoid vignetting and spherical aberration. I used the Samsung 16mm f/2.4 previously and tried both f/2.4 and f/2.8 but both apertures delivered good results. The Samsung 20mm f/2.8 can be used as well. Using the kit lens with it’s maximum aperture of f/3.5 or the Samsung 12-24mm f/4 you need to set the shutter speed to a much higher value. This can be problematic without an “equatorial” mount. Newer NX cameras have a “Smart Mode” called “Fireworks” which can set the focus to infinity. Additionally you need a lens that has a AF/MF switch. Change the mode dial to the Smart Mode (not Auto Mode!) where you can select different predefined shooting modes, e.g. Macro, Rich Tones or Fireworks. Select the Fireworks mode and press the shutter button half and a green focus confirmation will show up. The camera is set the focus to infinity. Afterwards change the AF/MF switch to MF and rotate to the mode dial to whatever mode you want to use (probably M). If there is any light source far away you can try to focus on this point. Afterwards set the focus to manual focus to lock it. If the previous failed try to set your ISO to the maximum value, turn on the framing mode and enable manual focus with the MF Assist setting set to “Enlarge 8x”. This is only for focussing and is needed to show you the stars as bright as possible on your display. Now try to focus until you see sharp dots or at least one proper focussed star. You can reset the changed settings (framing mode, MF assist, ISO) after you got a proper focus. Set the ISO number to a value which delivers barely acceptable image quality. Using the sensor used in the NX20/1000 I would suggest using ISO1600. With one of the newer sensors you might also try ISO 3200. Turn this setting on to remove disturbing image noise. For star trails you would need to turn it off to avoid gaps in the star trails. As you have mounted the camera on a tripod there shouldn’t be anything to stabilise. On a tripod the OIS can lead to blurry images and therefore you should switch it off. 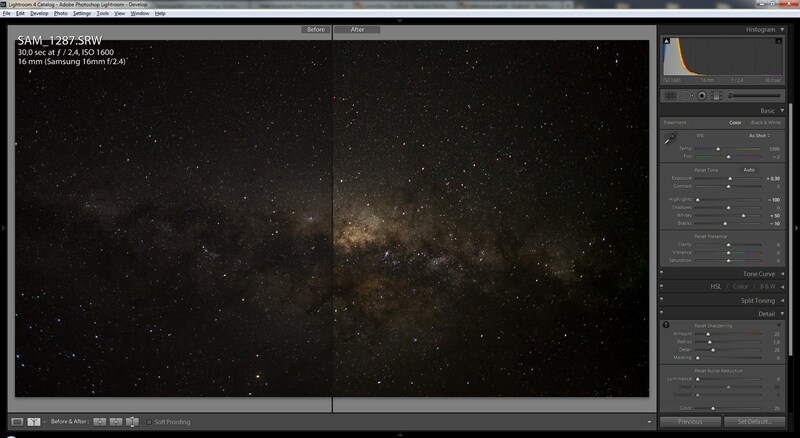 For astrophotography you should use RAW or RAW+JPEG SF. The camera applies noise reduction algorithms to JPEG files and this can be a problem as stars are similar to image noise. To avoid any noise reduction in camera you should use RAW. You can apply some slight noise reduction during development of the RAW files if needed. Small hint for the swivel display: You can use it to change the latest settings, but before starting to shoot images you should turn it away from the lens around to avoid that the light from the screen is reaching the lens. This could influence the photo in a bad way. That’s where the torch might get in. Depending on the brightness of the object you want to have on your photo you might need to use the torch to lighten it. Just try to quickly light all areas of the subject once in case it is too dark. The problem with star trails using a newer NX camera is that Samsung restricted the bulb mode (can be found in M mode) to a maximum time of four seconds (minor problem) and additionally you can’t disable the Long Term NR for the bulb mode (major problem). This is a problem for shooting star trails as the photos are delayed in time. The cameras with the “old” 14 MP sensors (NX5, 10, 11, 100) don’t have those restrictions and additionally they have the possibility to use an external power supply. If you have one of those cameras (I bought a cheap NX100 for this) you can play around with star trails. The newer cameras like the NX30 have a feature for interval captures integrated. This helps a lot as you can recharge the camera via USB while shooting. Star trails are nowadays made from many single shots and combined using image editing software later. There is a free software for this special procedure written from Achim Schaller. Visit his website startrails.de for more information. Postprocessing the photo is optional and depends on your personal taste. I am using Lightroom for postprocessing and wanted to brighten my photo up a little bit. I increased the exposure, increased the whites, decreased the blacks and played around with the highlights. I haven’t used noise reduction (luminance) in Lightroom as I want to avoid that the stars are removed as they are falsely detected as noise. You can carefully try to use the noise reduction sliders in Lightroom until the result is pleasant for you, but I would recommend to leave the noise as is. 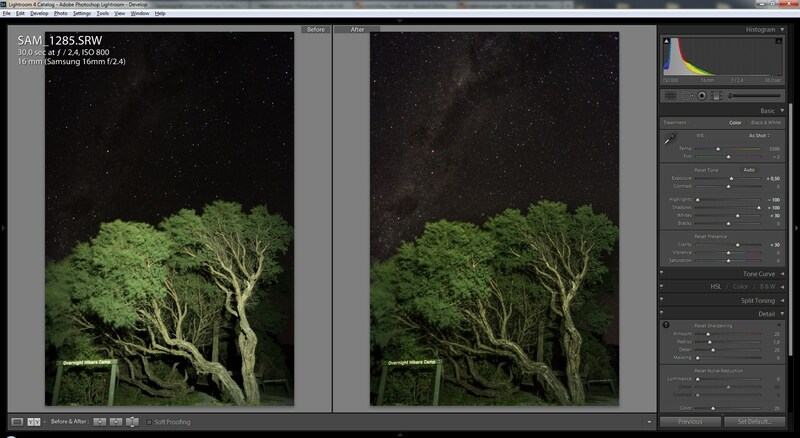 As you can see the structure in the night sky has improved and the tree fits in better. 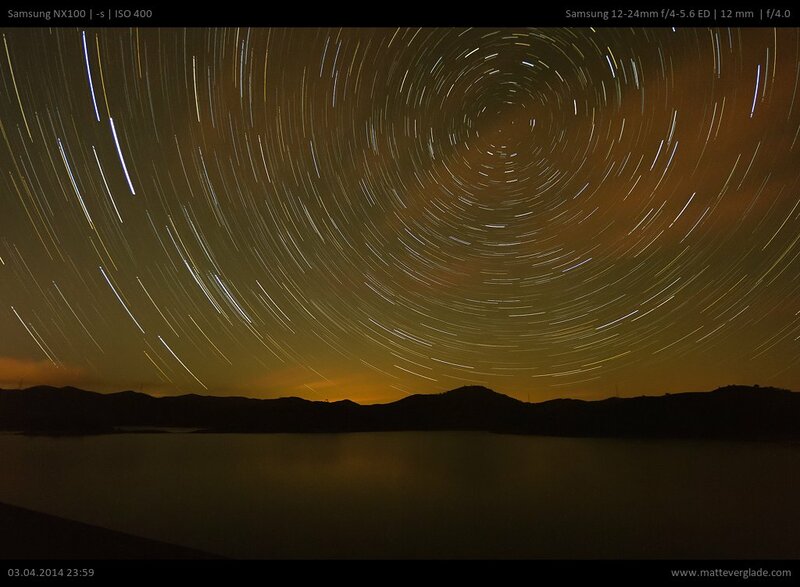 By the way: There is an official introduction on this topic from Samsung as well: Photographing the night stars. 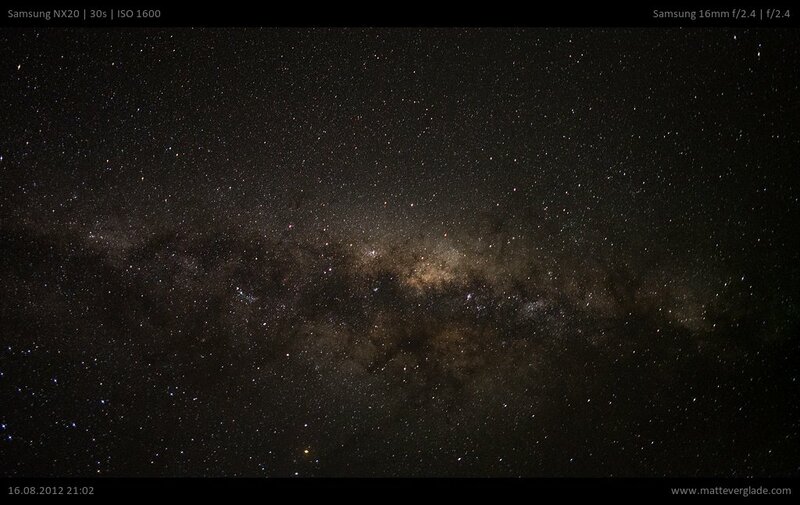 Comments on "How to photograph the stars"
Very nice article, especially given it deals with specifics of NX system. One thing I’d add is “barn door tracker” – everyone can look it up. It’s simple and cheap way to track stars. Everyone with a bit of skill can make one and be able to capture up to 10-15 minutes long exposures with wide angle lenses and say 5 minutes with normal without getting star trails. It’s simple substitute for equatorial mount with drive. I built one myself, now I’m waiting to get somewhere without light pollution. I’m a bit mad at Samsung that they dropped external power source and simple jack connector intervalometers from newer cameras. I bought these for NX100, but they are useless for NX20. Oh well… guess I’ll try astrophotography with NX100 – I have removed low-pass filter from it, so it should be able to capture almost twice as much light as before – normal + infrared. I wonder whether it’ll make much difference. thanks for the hint concerning the barn door tracker. The problem with the new USB port for charging AND remote controlling is that you can only use one thing at a time. For the remote control I have for the NX100 I bought an adaptor cable to use it on the USB port. I charge mine and use my android phone for the shutter and timer. You get do star trails by setting the exposure time, setting the camera to continuous and using the android with the shutter set to “press and hold” works really well. Apologies if you real ready knew that. Great article. Hey Matt, thanks for sharing the post processing detail. It was just what I was looking for. In regards to star trail photography I made a DIY programmable remote USB shutter controller for the NX300. If you turn off optical preview in addition to all the other normal night time adjustments you can get the lag time between 30sec shots down below 1sec. I posted some star trails taken with the NX300 on my flickr. Hello. I hope you are still around. I own a Samsung NX1000 and a Samsung NX300. I just purchased a Celestron 130EQ which is on its way and I hope to delve into astrophotography. I’ve been reading up on it. But my first question is about my cameras. There seems to be no setting at which I can point my camera at a starry sky, press the shutter, and the shutter will open. I’ve tried the fireworks mode, manual mode, etc. Does the camera need an object in its field on which to focus for the shutter to open and close? I call Samsung and they don;t know a whole lot about night photography. I’d like to capture the Milky Way or something with my 20/50 lens. Is that possible? Oh, and which stacking software do you use? And what duration of videos do you take to pull a final image from when filming maybe Saturn or Venus? Could you please reply to my email at callmeobie@yahoo.com? most of your questions have been answered in this article, please read it again carefully. Astro videos will be mostly impossible with your setup. For astro photos the 20-50 is not the ideal setup, the Samsung 16mm f2.4 or Samyang 12mm f2 are much better for it, see the article for the explanation, but you might just try it nevertheless. If you have more in-depth question, please feel free to ask them. Very nice intro, and I’ve been practicing ever since in preparation for 2 weeks in Alaska this August. I’m [very fortunate] to own the NX1 with 16-50 S F2-2.8 and Rokinon 12mm F/2. Once back, I’ll share pics. Knowing this article was written pre-NX1, any suggestions and insight would be most appreciative. PS: On a different note: If I buy the Canon FD 300mm F4 L we discussed on DPReview, I’ll be using YOUR ebay link. If you’re ever in the USA / DC Metro area, please contact me for anything. With both the 12mm f/2 and the 16-50mm S lens you have the best NX optics for astrophotography. I’ve never done astro with the NX1 though, but the strategy shouldn’t differ much. Maybe you have more options there and of course a better high ISO performance. Can’t really comment on this, I am not using a NX1 anylonger. Thanks Matt, great tips on how to achieve the sharpest focus possible. I’ll be giving that a shot next time with my NX1. I still think that even today, the NX1 is a beast of a camera – even after 4 years on the market. Thanks again. Hi Matt, hope you are still around. I’m looking to force the infinity focus (almost for landscape photography): once you halfpresses shutter button in the fireworks scene, you have to keep halfpressed the shutter button WHILE changing to manual, or you can release the button and change the mode?